Call COLEMANXCAVATION today to learn about our concrete lifting services! 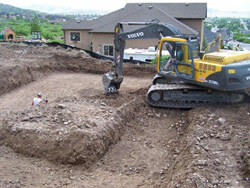 COLEMANXCAVATION is a full service excavation business based out of American Fork, UT. Family owned and operated since 1997, we take extreme pride in the work we perform. We have a wide range of experience in residential home excavation/development and commercial excavation/development. Combined with over 40 years experience, COLEMANXCAVATION knows what it takes to get the job done right the first time. This experience combined with our full line of services differentiates us from our competitors. We have seen it all and know exactly how to get things done for the best price. Our business owns a wide range of equipment, allowing us to eliminate the need for multiple contractors, save time, keep costs down and guarantee the highest quality of work possible. Serving Utah County including American Fork, Provo, Orem and Lehi, Utah.